As you hopefully knew, the UNMC BBQ was held in the MSC plaza less than 2 weeks ago. It was a beautiful day with hundreds of people showing up to play games, eat good (free!) food, find information on campus opportunities, and receive free items. There was even a fun Zumba demonstration! It was also the campus’s first Zero Waste Event. So what is a Zero Waste event? 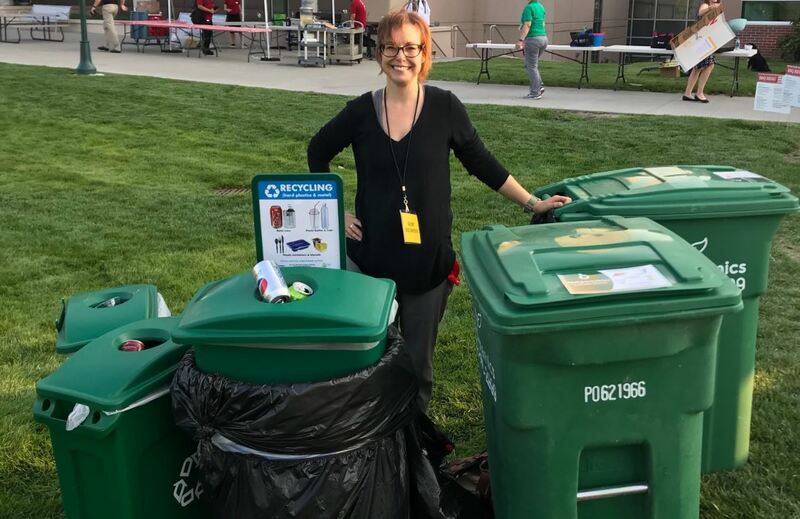 A Zero Waste event means that 90% of all the waste generated in prep for and at the event will be diverted from the landfill, generally by recycling and composting. While technically not ZERO waste, the 10% allows for things that are unavoidable—this is often plastic wrap that protects unprepared food (uncooked meat), etc. that planners cannot control and/or improper sorting by attendees. We can control the types of food served and can work to keep that waste to a minimum. We can also control the items given to the end user to make sure the can be composted or recycled. A special thanks to the LiveGreen Volunteers who stood at the waste stations and made sure attendees got the right items in the right place. If you see Vicki Cerino, Ashley Ryan, Chrystal Nathan, Jessie Horst, Tricia Saxton, Victoria Smith, Kimberly Norman, Debbie Vidlak, Theresa Pikschus, and/or Darren Dageforde, please thank them, they made this happen! Don’t forget to thank the planning committee and Sodexo too. Impressive! More than 900 meals and only 17lbs of trash! That comes out to 0.02lbs per person and has us easily diverting the 90% required. The picture at the side gives you an idea; the box on the ground is the only trash created and the back of the pickup is all recycling. This does not count the 5 totes completely full of future compost. Can you host a zero waste event? Maybe a departmental meeting or even a meal at home? Even if you are not 100% successful, you may start to notice ways to reduce your waste, and save you money. If you have successes or tips you think other people should know about, please comment on this post.